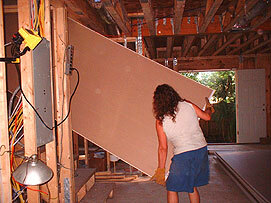 We got a great wholesale deal on the drywall sheets from a friend – but that meant we had to fetch them and then carry them into the house. After carrying a load or two in ourselves (that stuff’s HEAVY) we saw the wisdom in paying for people to carry it for us. Here’s the last sheet going on the downstairs pile. Note Elizabeth watching in the rear. Next, half had to be carried upstairs and we didn’t trust anyone else to do it, so us two girls, with friend Rick, humped it all up ourselves. After that, we thought we were done with moving drywall – but a check-in with the insulation guy, revealed that the sheets were stored just where he needed to put the insulation …so they were moved again. Barbie and Elizabeth ended up carrying each board at least twice! With the major utility supply lines installed, and the drywall stored upstairs and down, it was time to insulate the exterior walls. 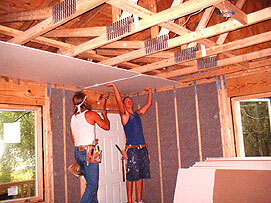 The roof space comes later – after the ceilings are in. 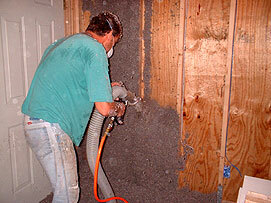 Here’s John of All Season’s Insulation spraying the stabilized, cellulose-based, insulation material between studs. It’s made from old newspapers and has high insulation properties, is non-toxic and fire-proof. When the spaces between all the studs in an exterior wall have been filled with the cellulose material, it’s necessary to scrape the excess that is proud of the studs. 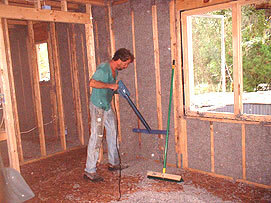 Here John is using a special electric rotary scraper that removes the excess without disturbing the “cling” of the material to the wall space. It took a whole day to clean up afterwards, but we all pitched in to help. Charles Sampson’s team of drywallers came early one morning soon after and installed the sheetrock like a video on fast-forward. It was impossible to take photos without being in the way of the seven-strong crew but we took a few anyway. Here’s the first ceiling boards going up in the main bedroom – some nailed; some screwed. It took three guys all of 20 minutes to slam-install the drywall into the kitchen. Note the balancing of the board on their feet while pushing it into place on the wall. Check out the recessed ceiling light cans and the duct for the range hood. The first tub we bought had to be returned to the supplier as it was damaged and the replacement didn’t show up until the drywall was almost complete. 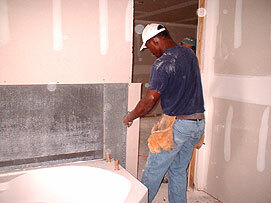 Once the tub was installed and the drywall edges and nail heads taped and sanded, Charles Sampson came by to personally install the cement board for the tub surround. This is necessary as a backer for ceramic tile in potentially wet situations. Note the cardboard tubes protecting the tub faucet handle spigots. 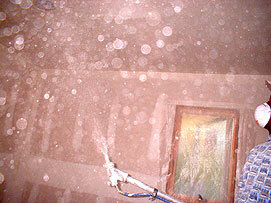 Charles stayed to spray the “knockdown” ceiling – a technique that creates a pleasing random texture that’s flattened with a special tool. We were particularly pleased with this finish as it looks great, doesn’t act as a dust trap and – best of all – requires no painting! Within five days of actual work, the drywall was installed, the seams taped over and sanded and the “knockdown” ceiling finished. The familiar “open” feel of the house was peculiarly transformed and it took a while to get used to the change in acoustic properties. 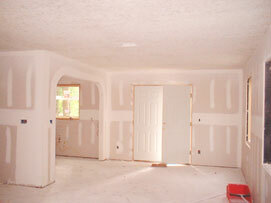 They did a great job and we were ready for painting in what seemed like record time. 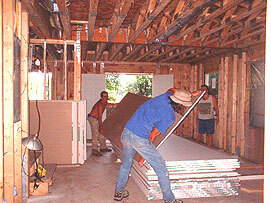 While all this was going on, Andy and Wes were slogging on with the siding and we soon got to the stage you see here. We were, and are, completely besotted with the siding color and think the exterior of the house looks great in this shot from the mobile home roof. 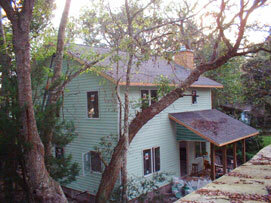 If you look at the far end of the house roof you’ll see that the chimney – most challenging aspect to install siding on – remains to be covered. 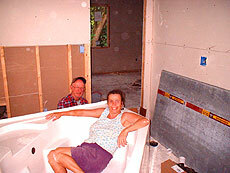 A day or so before Andy finished the siding on the front, Barbie’s Aunt Pat and her husband Otis visited and we had this photo taken for …guess who? Barbie’s mom – Joy. 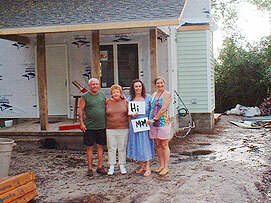 For our part, we could not believe our dream home was taking shape so readily.